A tweet from T-Mobile USA yesterday announced that the Motorola Defy, a ruggedized Android handset aimed at a more active audience, would be going on sale November 3rd for $99.99 with a two-year contract. 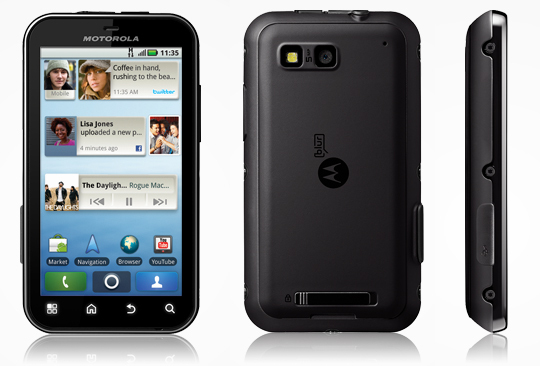 The Motorola Defy's most defining feature is arguably not related to the electronics inside, but the water, impact, dust and scratch resistance designed into the device's case. In my opinion, the price point for this mid-range Android phone, $99.99, makes it very competitive, even without considering the ruggedness of the device. It may even convince a fair number of outdoor enthusiasts that they too can have a smartphone to take with them on trips which can handle just about anything that gets thrown at it. I'm not sure about you guys, but the idea of a ruggedized handset like the Defy is definitely a major plus for any hadset that I would consider buying, as I am more than a tad clumsy sometimes, and often lose things that aren't attached to my body. The only thing that causes a second thought is that the device is releasing with Android 2.1 when Motorola have had access to Android 2.2 for months. Take a look at this video if you'd like to see the Defy getting its "baptism by fire"...or is it water? Either way, this is definitely a device that I'll be keeping my eyes on.